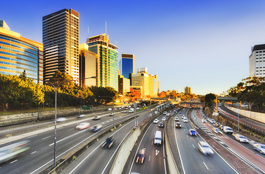 During the September 2017 quarter, the NSW Compulsory Third Party (CTP) scheme was governed by the Motor Accidents Compensation Act 1999 (the Act). The Green Slip market currently comprises six licensed insurers operated by four entities: Suncorp (AAMI and GIO), Allianz Australia (Allianz and CIC Allianz), NRMA and QBE. 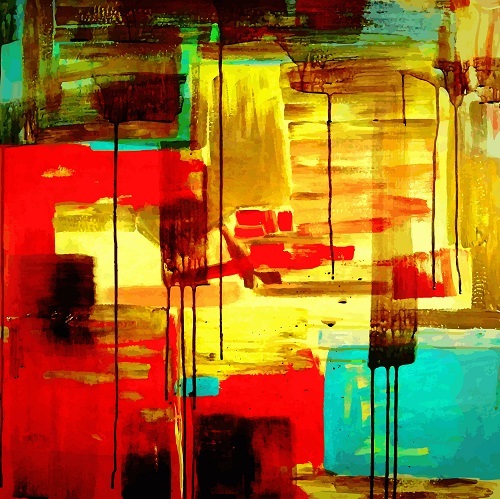 The market is split into two segments: retail and non-retail. AAMI, GIO, Allianz and NRMA compete mainly in the retail segment, CIC Allianz competes in the non-retail commercial vehicle market and QBE operates in both market segments. Section 172 of the Act requires SIRA to inform each licenced insurer of their premium market share on a quarterly basis. Additionally, SIRA provides detail average Green Slip price trends and claims reports to insurers every quarter. The claims trends include aggregate claims numbers and claims costs, illustrating the claims experience of the current scheme. During the September 2017 quarter, all six insurers implemented new prices that took effect from 1 July 2017. Further to this, NRMA and CIC Allianz filed for reductions in their prices to take effect from 4 September 2017 and 1 October 2017 respectively. As a result of these filings, GIO lost its market best price lead during the September 2017 quarter to QBE who offered the best price of $588 for Sydney private passenger vehicles. Despite NRMA’s best price being $6 above QBE, NRMA continued to dominate the market with a share of 30.2 per cent due to its brand impact, branch network and product bundling. As a result of the NSW CTP reform, all insurers lodged premium filings with SIRA during the September 2017 quarter which SIRA approved to take effect from 1 December 2017 in accordance with the Motor Accident Injuries Act 2017. NRMA will be offering the best price of $468 for a private Sydney passenger vehicle from 1 December 2017. Insurers set their own Green Slip premiums in a competitive market, within part 2.3 of the 1999 Act and the Motor Accidents Premiums Determination Guidelines approved by the SIRA Board. Insurers can file proposed premiums with SIRA at any time and there is no limit to the number of filings an insurer may lodge each year. There was no change to the MCIS levy rates during the September 2017 quarter. During the September 2017 quarter, all six implemented new Green Slip prices that took effective from 1 July 2017. Table 1 shows the changes in best prices that occurred during this reporting quarter. The best price is the lowest CTP premium price (including levies and GST) offered by each insurer to a new retail customer, aged 30 to 54, for a private use passenger vehicle garaged in Sydney. GIO lost its market best price lead during the September 2017 quarter to QBE who offered the best price of $588 for Sydney private passenger vehicles. Despite NRMA’s best price being $6 above QBE, NRMA continued to dominate the market with a share of 30.2 per cent due to its brand impact, branch network and product bundling. Insurers are required under the Act to submit information on insurance premiums to SIRA at the end of each quarter. This information is used to determine the premium market share for each insurer and to report trends in average premium levels over time. The total amount of premiums collected (excluding MCIS levy and GST) during the year to 30 September 2017 was $2.65 billion. This represented an increase of around 7.7 per cent on the previous year ($2.46 billion). Table 2 shows Allianz and QBE gained 0.7 per cent market share each when the September 2017 quarter premium share is compared to September 2016 quarter. GIO, AAMI and CIC Allianz lost 0.8 per cent, 0.5 per cent and 0.1 per cent market share respectively compared to September 2016 quarter. NRMA market share remained unchanged at 30.2 per cent when the September 2017 quarter premium share is compared to September 2016 quarter. Generally, AAMI, NRMA and QBE market shares continue to trend downwards over the past 5 years, NRMA still remains the insurer with the largest market share. GIO and Allianz continued to gain market shares over the past 5 years while CIC Allianz market shares appear relatively stable. The average premium (including MCIS levy and GST) paid by Sydney passenger vehicle owners was $695, an annual increase of $32 (4.8 per cent). However, there is a reduction of $26 (3.6%) compared to the June 2017 quarter figure of $721. The average premium paid by Country (regional) passenger vehicle owners was $473, an annual increase of $5 (1.0 per cent). However, there is a reduction of $18 (3.7%) compared to the June 2017 quarter figure of $491. 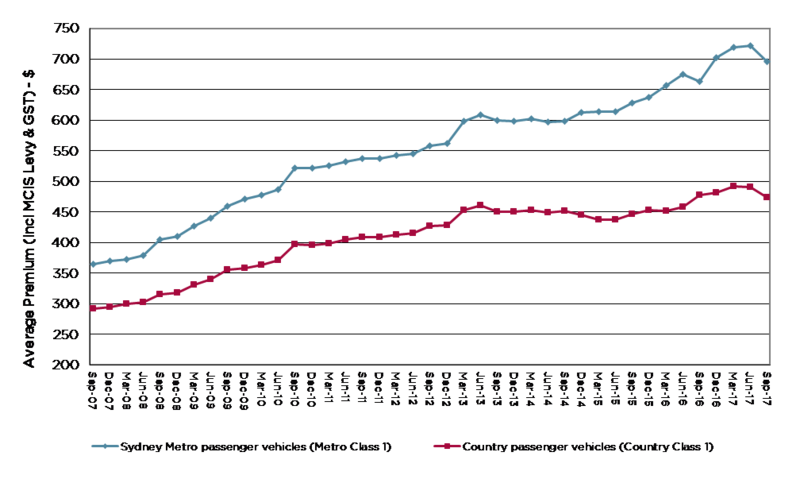 While the increase in the number of small claims reduces the overall average claims cost, the long term increase in claims frequency means the overall effect is an increase in the cost per policy. However, if the reduction in claim frequency in the last four quarters continues, these cost pressures may ease resulting in reductions in Green Slip prices. Claims trends are measured from 5 October 1999, when the Motor Accidents Compensation Act 1999 came into effect. The scheme actuaries complete an annual valuation of the scheme in June each year to provide projections for the number of claims expected to be reported. In the September 2017 quarter, the actual number of newly reported claims since the previous quarter, June 2017, was 4,080. This is 7 per cent less than the 4,393 anticipated from the June 2017 actuarial valuation of the scheme. Some of these newly reported claims were lodged with respect to past accident quarters. 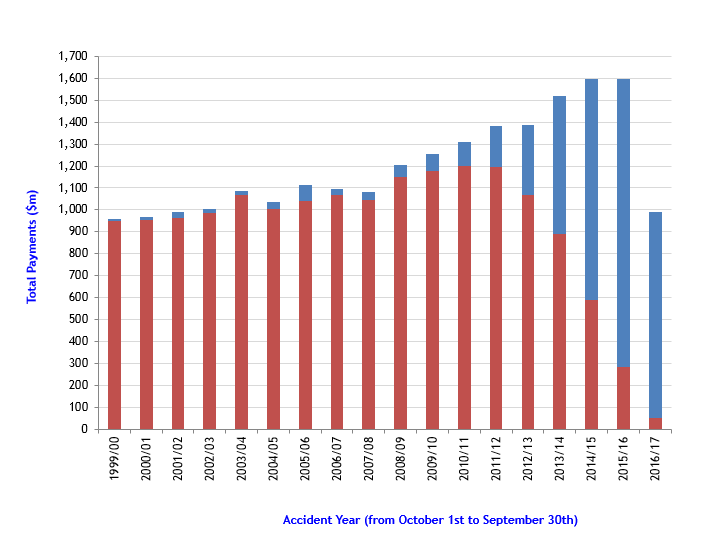 The number of claims reported from accidents in the September 2017, was 2,143, which is in line with expected number of claims as the impact of the November 2016 legal cost regulation, market response to Strike Force Ravens (note 1), and implementation by insurers of new claims management practices designed to combat fraud and exaggeration is realised. Graph 4 shows the number of CTP claims per accident quarter (note 2). Since March 2008 there has been a clear upward trend in the number of claims per accident quarter from 2,451 in March 2008 to 4,571 in June 2016 and thereafter the number of CTP claims per accident quarter had been estimated to decline to 3,912 in June 2017 and 4,219 in September 2017. Graph 5 shows the trend in claim frequency by accident quarter. Claims frequency increased consistently from 22 claims per 10,000 vehicles in March 2008 to 34 claims per 10,000 vehicles in June 2016 and thereafter it has declined. The estimated claim frequency for the September 2017 accident quarter is 31 claims per 10,000 vehicles and the average for the year to September 2017 is 30 claims per 10,000 vehicles. As at 30 September 2017, a total of 242,759 notifications (full claims and ANFs) have been reported since the current scheme commenced in October 1999. The total incurred cost (note 3) associated with the notifications is $21.7 billion with $16.7 billion claims cost paid. It is estimated that $4.9 billion (23%) is yet to be paid for claims reported to date. Graph 6 shows how this unpaid amount is distributed across prior full accident years. 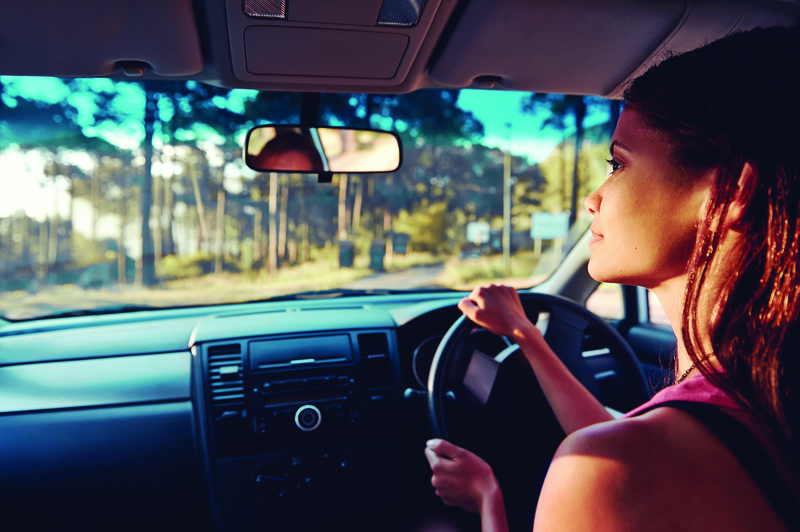 Further development in payments is anticipated for accident year 2016/17, as late claims are reported and estimates for already reported claims are revised in line with new information becoming available to insurers. 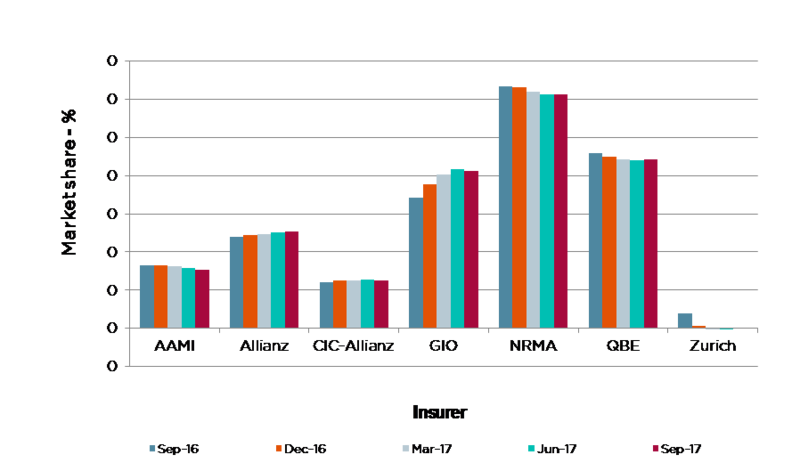 The trend in average incurred costs of full claims (note 4) is shown in Graph 7 below. The incurred costs have been derived from historic claims payments supplied by insurers and are not adjusted for inflation. Since September 2012 average incurred cost began to fall during the period when the proportion of legally represented minor severity claims increased. For claims already reported, insurers will continue to revise their cost estimates as more information is received on these claims. Insurers are yet to receive late claims from some accidents that have already occurred but not yet had claims lodged; this especially applies to the four most recent accident quarters. 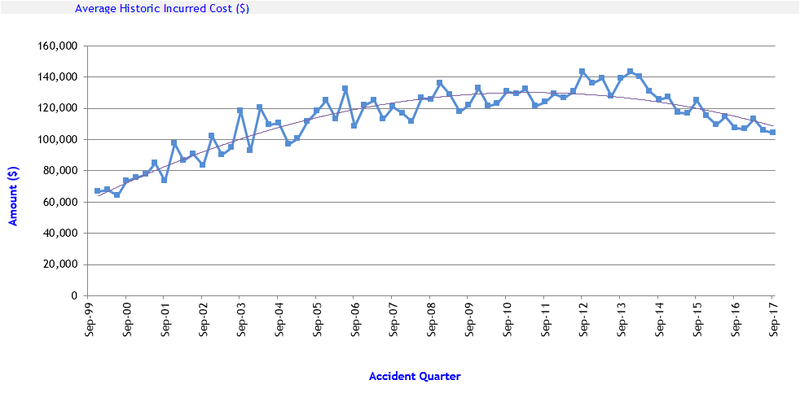 These revisions and late reports introduce some uncertainty in the average cost estimates hence the trend line superimposed on Graph 7 presents a more likely level of final average costs of claims in more recent accident quarters. 1 Operation Strike Force RAVENS, funded by SIRA and run by the Fraud & Cybercrime Squad of the NSW Police Force in August 2016. 2 The numbers of claims reported for accidents from 2014 onward, includes projections for claims incurred but not yet reported (IBNR). 3 Incurred cost comprises the amount already paid on claims plus an estimate for likely future payments on claims yet to be finalised. The Incurred costs have not been adjusted for inflation.